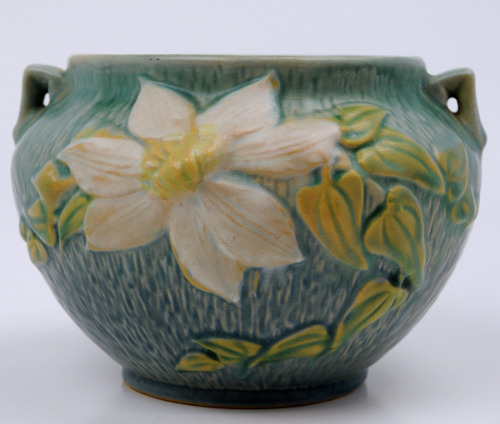 An excellent condition and well marked authentic Roseville 667-5 Clematis Pattern Jardiniere. This fine pottery has no chips, cracks, hairlines, or repairs anywhere. The base and inside are the natural deep yellow-beige clay, hallmarked with Roseville 667-5, the maker signature marks, and marked U.S.A. as all authentic Roseville pieces are. There is natural light crazing and the smooth soft matte finish genuine Roseville pieces are famous for. An excellent quality piece in excellent condition for your collection or decor! Weight: 2 lbs & 11 oz. IMPORTANT FREE SHIPPING NOTE: This Jardiniere will ship very carefully padded, doubled box packed and USPS Priority Mail for safe and faster delivery absolutely free to your doorstep!